When you are in the unfortunate position of having a lice infestation in your flock, there is one inescapable truth; you have only one opportunity to eradicate per year and that is at shearing. The use of long wool treatments can be an important tool for minimizing fleece damage when a mid-season infestation is detected, but they cannot and do not claim to eradicate lice. This means that a post shearing treatment will be necessary. With this in mind the importance of getting it right cannot be understated. To maximize the chances of achieving eradication, it is crucial that all parts of the program are done as well as possible. The first step in this process is ensuring that your sheep are cleanly shorn. Shearing has by far the greatest impact on lice population, accounting for up to 66% being physically removed. Many of the remaining lice will also die from the change in temperature and humidity which results. Tufts of longer wool provide a haven for lice to take refuge in, also reducing the likelihood of chemicals reaching the lice; especially important if your chosen chemical is a pour-on. Delivering the chemical to the lice is critical to effectiveness. Be aware that the breakdown in many lice eradication programs is due to under-dosing and poor application. The world’s best stock-proof fences cannot protect you from re-infestation if the source remains within your flock. When using pour-on products (particularly low volume single stripe) there is little margin for error, and the potential for big (expensive) consequences. 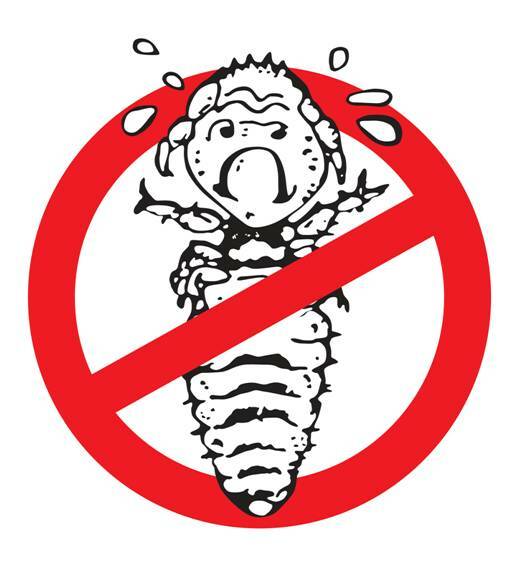 Whilst pour-on products remain the most common method of treating lice due to convenience, there are numerous limitations associated with them, notably where dermatitis and fleece rot are present pour-on treatments are not effective. Therefore if these are an issue within your flock, dipping is really the only viable option available. Be aware of chemical resistance in your district; especially if you suspect your lice infestation may have arrived with purchased sheep, you must consider what chemical resistance exists where those animals have come from. If you apply an IGR to an IGR resistant population, regardless of how perfectly you have executed the rest of your eradication program, using the wrong chemical will guarantee that lice remain in your flock. Split shearing is another common cause of failure in lice eradication programs. As it only takes one lousy sheep to re-infest your flock; any unshorn or untreated sheep are a liability. With the considerable effort and expense which goes into lice eradication, removing split shearing should be seriously contemplated. Although some label claims offer protection for months after treatment; relying on this protection is not recommended. In the same way that under-dosing is well recognized for its role in resistance developing, depending upon chemicals for residual protection rather than as a knock down product as intended, is likely to cause resistance to develop more rapidly. Finally, think about the role of wooly lambs in your lice eradication program. The close contact between a ewe and lamb is ideal for the spread of lice; and if your chosen chemical is a pour-on, the chemical will take around 6 weeks to travel around the sheep meaning viable lice can be transferred to the lamb, and in due course back to the ewe. This article has been supported by the SA Sheep Industry Fund through the Sheep Lice Extension program. Is lice an issue in your area? A local lice action group or sheep health group is a great way to reduce lice infestations and potentially eradicate lice from your area. Open communication with neighbours is vital in your campaign to keep lice out. Contact Bruce Hancock, 0417 813 545 or Alex Stewart, 0477 362 664 for more details about forming a lice action group.